Please note that The English College and Manor Primary School are in the process of being merged into a single all through school – from FS1 (3 years old) to Year 13 (18 years old). The websites will be merged in the next few months, until then please click on this link for the primary school website. 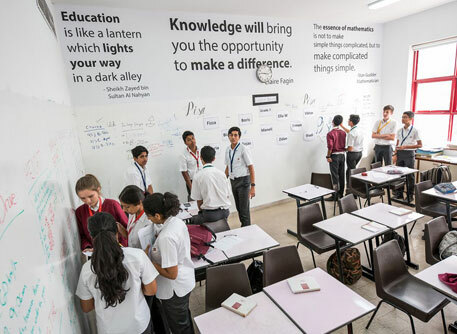 The English College, Dubai was established in 1992 and has grown into a well-respected and highly sought-after school in the region. Following the British curriculum, our school offers classes from Year 7 to Year 13. Student numbers are approximately 600 and all classes and lessons are taught and supported by UK-trained and highly qualified teaching staff. Great emphasis is placed on developing the whole child in a stimulating, caring environment. Excellent relationships exist between staff, student and parents, something we are very proud of. We invite you to take a walk through our website which offers a wealth of information on school life, the enhanced curriculum on offer and the outstanding ethos and atmosphere that exists at The English College, Dubai.